Today we celebrate the Fourteenth Sunday in Ordinary Time (B) and this morning Fr. Nicholas Williams, the newest priest of the Cardiff Diocese, will offer his First Mass at his home parish of Blessed Sacrament, Rumney in thanksgiving for the gift of the priesthood. It strikes me that todays readings are very apt for a newly ordained priest who journeys home to be with the community that he has called ‘home’ for so many years. Although Jesus warns in todays Gospel that “A prophet is only despised in his own country, among his own relations and in his own house” (cf. Mk 6:1-6) the joy and blessing of a ‘First Mass’ is surely the exception to the rule. 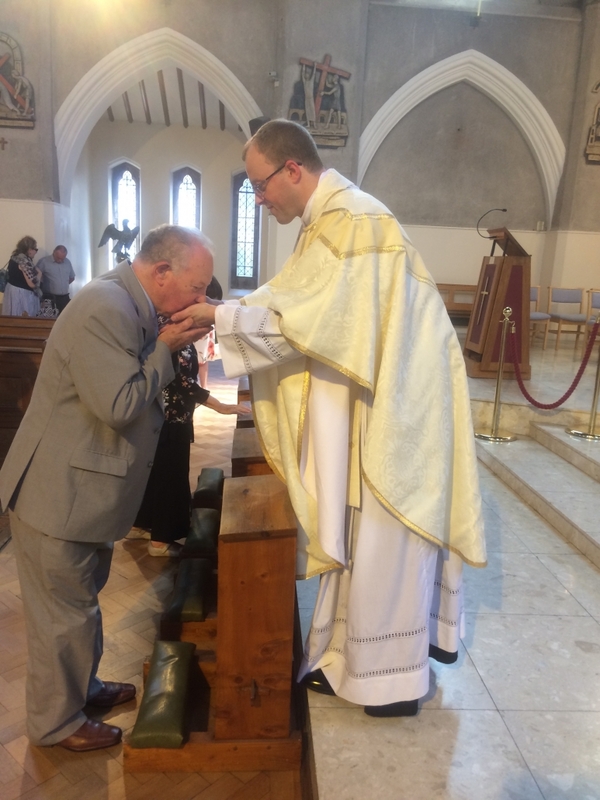 As the newly ordained makes Christ truly present to the people for the first time, in his home town, there is often much celebration as the ‘First Mass’ brings many graces to the priest, his family and the community that helped nurture the newly ordained. This is the fifth ‘First Mass’ to take place within the boundaries of our Diocese this year as three men have presented themselves for service as Diocesan priests and two men to the Personal Ordinariate of Our Lady of Walsingham. For each of the five men who have offered themselves so generously to the Church I have no doubt that the words of St. Paul letter from today’s Second Reading “My grace is enough for you: my power is at its best in weakness” (2 Cor 12:7-10) have carried them forward to begin their ministry among us. The build up to the Ordination is always a time of nervousness and last minute human questioning. Then the Bishop asks the ultimate question “Do you judge him to be worthy?”. I remember vividly thinking at my Ordination ‘no’, but the Lord speaks “My grace is enough for you: my power is at its best in weakness” as the priest presenting the candidate responds that after a very rigorous formation process ‘we judge him worthy’. Yesterday brought what can only be termed as a ‘season’ of Ordinations within our Diocese to a close. Fr. Nicholas Williams was ordained by Archbishop George Stack at Cardiff Cathedral. Representatives from Fr. Nick’s family were present including his parents and his brother. Along with family there representatives from across the diocese, and from Oscott College in Birmingham where the newly ordained has spent the past six years in formation. All joined together for a moving celebration and conferral of the gift of the priesthood on Fr. Nick. During his homily the Archbishop spoke of the service to which the priest is called. The service of drawing out the Common Priesthood of all the Baptised by ‘forming’ the people he meets in the Good News of Jesus Christ to be active disciples and co-workers with the priest in building up the Kingdom of God here on earth. It struck me that it was two years ago at the Mass of Chrism the Archbishop spoke of the ‘perceived’ shortage of priests and countermanded that we don’t lack priests, we lack people. The phrase that seems to encapsulate this is ‘intentional disciples’, that is disciples who not only listen and perceive but also follow and lead. Each and every baptised person has a ‘role’ a ‘mandate’ given by the Lord to be fulfilled for the building up of the Kingdom. For the priest he is to be the ‘Pontifex’ (the bridge builder) who bridges the gap between the human and the Divine and enables those he walks with and accompanies on the journey to draw others to the wellspring of salvation found within the Church and the Sacraments. In doing this he enables the ‘common priesthood of all the faithful’ to find its fullest expression in the ‘drawing in’ and sacrificing of (our) hearts and (our) lives to Almighty God each and every time we ‘lift up our hearts’ in the Mass. As a Diocese we thank Fr. Nicholas Williams, Fr. Robert James, Fr. Peter Davies (Diocesan priests); and Fr. David Hathaway and Fr. David Pritchard (Ordinariate) for their sacrifice and service among us. And we offer them our prayers for every blessing over the years ahead. Continue to pray for our priests in their ministry and thank God for our retired priests who have served the Diocese faithfully and now ‘rest from their labours’. Continue to pray also for more Vocations to the priesthood within our Diocese. It is through your prayers that more priests are given to us “Ask the Lord of the harvest to send labourers into his harvest” (Mt 9:38). Perhaps you are reading this and searching for the Lord’s call in your life. Maybe you feel he is calling you to priesthood. To explore how God may be calling you in your life visit the Vocations section of this website. Do not be afraid, you may feel uneasy but “My grace is enough for you: my power is at its best in weakness”. Photograph: Fr. Nicholas Williams having imparted his ‘first blessing’ to his father. Cardiff Cathedral – 7th July 2018. Courtesy of Rev. Mr. Laurence Bryce.